Mixmag has premiered another track from the Mobilee Back To Back Vol. 9 compilation. This time streaming Sebo K – Moved feat. Prosumer (Re.You Remix), the unreleased remix with officially hit stores today on the second disc of the compilation. You can stream the remix now over on the Mixmag website. Groove magazine has premiered Re.You's remix of Anja Schneider's most recent "Jimmy" EP. You can now stream the remix online over on the Groove Magazine website. His remix of 'Lovetube Thinking' will be featured on disc 2 of the famous Mobilee Back To Back compilation series. Don't forget to grab your copy this Friday when the compilation hits stores. Mobilee Back To Back Volume 9 Presented By Re.You hits shelves this Friday but is already creating a buzz online thanks to Thump magazine. The online magazine has featured a raving review of the second disc in the compilation as well as an exclusive stream of session two from that disc. You can read the review and stream the set over on the Thump website. Re.You sat down with Pulse Radio for an interview about his upcoming Mobilee mix compilation Back To Back Volume 9. You can read the full interview over on their website and be on the look out as Mobilee Back To Back Volume 9 hits shelves this Friday. Igor Vicente has just posted his set from his famous State Of Flow party in Belgium. You can stream the three hour set over on his Soundcloud. Pulse Radio has featured a full recap of the 3 day club portion of CTEMF in South Africa. Anja Schneider played the first night of the festival and shared the stage with Bryan Travis, Metro Ticket, HVOB, Fogshow, Loco Dice, and Maelstrom. A full review of the show is featured in the recap over on Pulse Radio. Groovefest has announced its second phase of artists that includes Anja Schneider and Rodriquez Jr. The week long festival takes place in September in the Dominican Republic and also features artists like Art Department, Green Velvet, Lee Foss, and Nick Curly. They are offering travel and hotel accommodations on the Groovefest website. Grab your tickets and join us for some fun in the sun! Slash9.TV has posted a great recap video of 2014 that features clips from Anja Schneider, Ray Okpara, and Igor Vicente. You can watch the whole video below or on the Slash9.TV Vimeo. SLASH9.tv ● Official 2014 Reel ● from Chilli Out / SLASH9 on Vimeo. Rodriquez Jr sat down with Greek magazine Ozon for an interview about music, Mobilee, and his reaction to the Athens night life. You can read the entire interview over on the Ozon website. 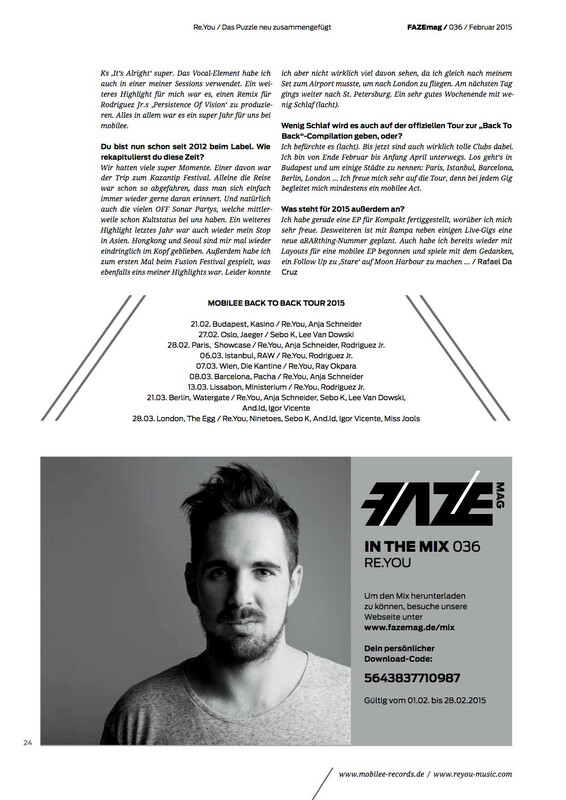 Re.You has sat down with Faze Magazin for an exclusive interview and mix. 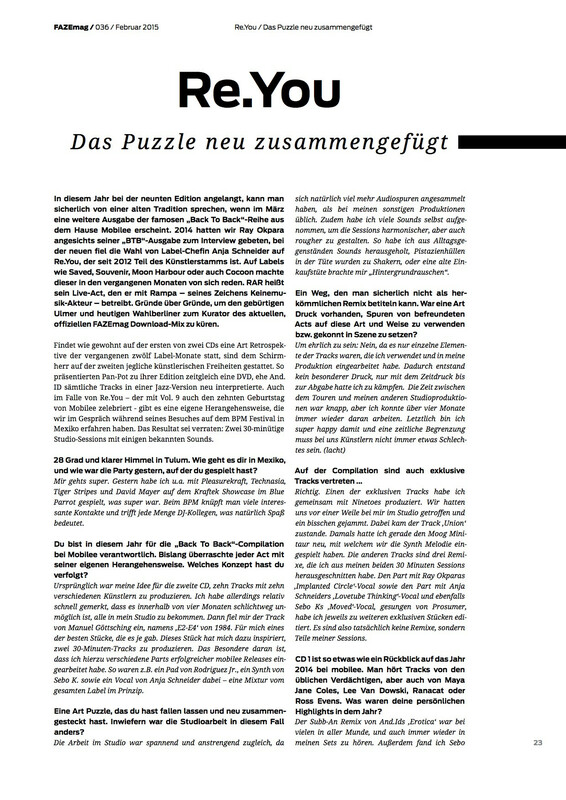 You can read the full article below or over on Faze Magazin.